Collect pine cones. If you didn’t collect any to add to your fall décor, don’t worry! Pinecones make beautiful Christmas decorations. Spray paint them silver, white, or gold, or leave them their natural color. Place them in a basket on a table, mantle, or hearth, and you’re done! Set up a campfire and roast some marshmallows. If the kids are still craving something sweet, bring out the graham crackers and chocolate and make some s’mores. Go outside to write or draw. You can even start a nature journal. You can read more here. Go on a fall scavenger hunt. You can find a list of ideas on GoExploreNature.com. If you have younger children, print out this page by TheChirpingMoms.com. Gather colorful fall leaves, and then identify them. You can use field guides or try the app LeafSnap. Want to preserve them? Check out the tips for preserving leaves on 50Campfires.com. 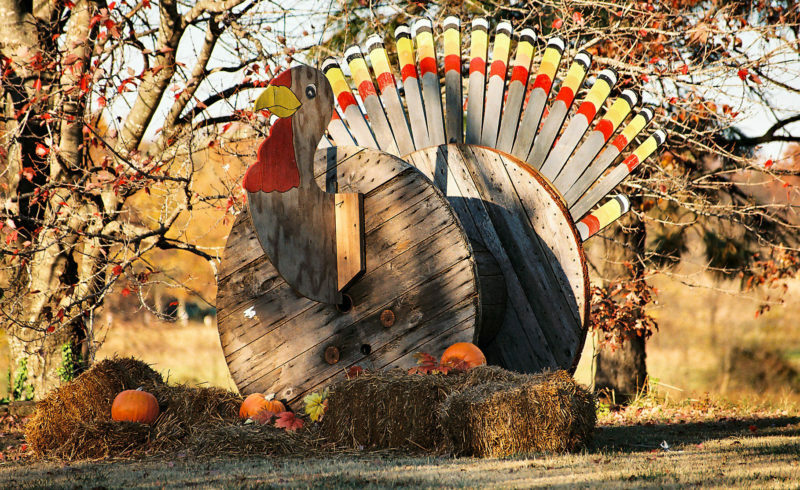 Run in a Turkey Trot. Turkey trots are footraces, or fun runs, held on Thanksgiving to help you burn off some of those extra calories you’ll probably consume. You can find turkey trots in your area by clicking on the map on this site. Pick out a tree. It’s almost Christmas, so what better time to go out hunting for the perfect Christmas tree? The smell of fresh pine is sure to get you in the holiday mood. Take a hike together. The weather is getting colder, and with the busyness of the holidays, you might not have many more opportunities to go hiking before the new year. Take a camera along. Not only can you capture some wonderful memories, you might also get just the right family photo for your holiday cards.